Are you sure your patient has sepsis or septic shock? What are the typical findings for this disease? Respiratory dysfunction characterized by: paO2/FIO2 < 300 in the absence of cyanotic heart disease; PaCO2>65 torr; need for FIO2 > 0.5 in order to maintain oxygen saturation > 92%; and/or need for non-invasive or invasive mechanical ventilatory support. Neurologic dysfunction characterized by Glasgow Coma Score <11 or acute mental status change. Hematologic abnormalities including thrombocytopenia (<80,000/mm3; or decrease by >50% from baseline) or INR > 2.0. Renal dysfunction characterized by serum creatinine >2 times the upper limit of normal; or >2-fold increase from baseline. Hepatic dysfunction characterized by total bilirubin >4 mg/dL or ALT 2 times the upper limit of normal for age. The systemic inflammatory response resulting in tachycardia, tachypnea, hyperthermia, and leukocytosis can also result from trauma, burns, pancreatitis, and other insults. It is the proven presence of, or strong suspicion of, a pathogenic infection triggering the response that distinguishes sepsis. There are specific phenotypes that clinically overlap with sepsis, but have unique pathologies that impact clinical management decisions. Two primary examples include: Thrombocytopenia-Associated Multiple Organ Failure (TAMOF), which occurs due to an acquired deficiency in the ADAMTS (A disintegrin and metalloprotease with thrombospondin motifs)-13 protease, formerly known as von Willebrand factor (vWF) cleaving protease responsible for cleaving von Willebrand multimers. In the absence of this protease, large von Willebrand factor multimers form, thereby creating microvascular thromboses throughout multiple organs. Treatment modalities include replacing the protease (with fresh frozen plasma transfusion) or plasmapheresis/plasma exchange, which both removes the large vWF multimers and replaces the protease. The second example of an overlapping pathology is secondary hemophagocytic lymphohistiocytosis (HLH), which shares many laboratory and clinical characteristics of severe sepsis. HLH is characterized by dysregulated inflammation, including prolonged fever, rapid expansion of lymph tissue, notably the spleen, and cytopenia. A similar constellation of findings in the setting of underlying rheumatologic disease is described as macrophage activation syndrome (MAS). While difficult to clinically distinguish from severe sepsis, it is imperative to do so because the therapeutic approaches differ. Sepsis and septic shock can affect healthy children with no apparent underlying risk factors. Several recent studies have suggested that there may be as yet undefined genetic underpinnings to an increased risk of sepsis; however, there are several other risk factors that can predispose the pediatric host to sepsis. These include: early age (neonates possess an immature immune system, placing them at greater risk), malnutrition (there is a higher risk and higher mortality rate noted in developing countries, perhaps worsened by anemia and hypoproteinemia), immunosuppressive medications (notably in oncology and transplant patients), congenital immunodeficiencies, and children with co-morbid illnesses such as chronic renal failure, ventilator-dependence, and neurologically impaired children at risk for recurrent aspiration into the tracheobronchial tree. In addition, certain aspects of intensive care (e.g., indwelling central venous catheters, endotracheal tubes) may place the child at risk for developing sepsis in the intensive care unit. Neonates: Group B Streptococcus, Gram negative enteric organisms (e.g., E. coli, Klebsiella pneumoniae), and herpes simplex virus. Less commonly Listeria monocytogenes. There are several conditions that inhibit the immune system from responding to an infection that can predispose a child to sepsis (i.e., young age, malnutrition, immunosuppressive medications, congenital or acquired immunodeficiencies, indwelling catheters). In such circumstances, additional pathogens such as Pseudomonas species and fungal species (e.g., Candida) are often cultured. However, it remains important to emphasize that sepsis also develops in individuals with completely intact immune systems. The definition of sepsis includes criteria for the white blood cell count. The percent bandemia and hematologic dysfunction is characterized by low platelets and elevated INR; therefore, a complete blood count and measures of clotting function (i.e., prothrombin time, partial thromboplastin time (aPTT), INR, fibrinogen, and D-dimer) are indicated. Findings consistent with sepsis include elevation in PT and aPTT, INR, or D-dimer, and decreased fibrinogen. Other organ dysfunction may be gauged by measurement of creatinine, ALT, and evidence of acidemia quantified by elevated lactate obtained by arterial puncture or vascular catheter (or low serum bicarbonate); therefore, a renal panel and comprehensive laboratory panel including liver function tests should also be obtained. Measurement of respiratory dysfunction and lactate can be measured on a routine arterial blood gas. Of note, the presence of cardiovascular dysfunction, particularly involving the use of vasoactive agents, typically necessitates placement of an indwelling arterial catheter from which ABGs can be drawn. Adequate global delivery of oxygen can be estimated from the presence of a normal mixed venous saturation ideally measured from a pulmonary artery catheter, which is rarely used in pediatrics. Therefore, a central venous catheter whose tip is more centrally located (at or near the superior vena cava [SVC]- or inferior vena cava [IVC]-right atrial junction) can provide an estimate of the mixed venous saturation. A value >70% is usually indicative of an acceptable balance between oxygen delivery and consumption in a patient without cyanotic heart disease, in which case a “normal” value would be approximately 25% below the systemic oxygen saturation value. Because the definition of sepsis includes the presence of a pathogen, cultures from multiple potential sites of infection, typically, blood, urine and cerebrospinal fluid, particularly in the setting of mental status changes, are necessary. Other potentially infected sites/fluids, such as pleural fluid (in the setting of effusion), tracheobronchial secretions (in the presence of endotracheal or tracheostomy tube) or peritoneal fluid (in the setting of ascites) may need to be obtained for multiple pathogen culture (bacterial, viral, fungal). Markers of inflammation may be helpful, including erythrocyte sedimentation rate (ESR) and C-reactive protein (CRP), although their value as non-specific markers in distinguishing the presence of sepsis is limited. Another marker that has been examined in sepsis is procalcitonin (PCT). PCT is the prohormone of calcitonin normally secreted by cells of the thyroid gland, but can be produced by numerous cell types following a proinflammatory, bacterial challenge. Numerous studies have examined the use of procalcitonin in distinguishing patients with sepsis and have suggested that elevated PCT (generally on the order of ≥ 2 ng/mL) may correlate with the presence of sepsis with reasonable sensitivity and high specificity. This suggests that a PCT assay could be a useful biomarker of sepsis, although this is not yet typically utilized in common practice in the pediatric ICU. Hypocalcemia may adversely affect myocardial function and vascular tone. Thus, an ionized calcium may be obtained. Finally, sepsis investigators have attempted to define other biomarkers that could be valuable in providing either complementary diagnostic or prognostic information in the setting of suspected and/or established sepsis. Some examples include inflammatory cytokines (e.g., tumor necrosis factor alpha, interleukin (IL)-6, IL-8, and IL-10), trace elements (e.g., zinc), or even whole genome expression patterns; however, to date these efforts remain at the clinical research stage. Chest x-rays are helpful to help assess for possible pneumonia. A chest x-ray is also helpful in assessing the presence or absence of cardiomegaly resulting in cardiogenic shock. It is important to distinguish between cardiogenic shock and septic shock, as their clinical presentations may be similar but the treatments are different. An additional imaging approach gaining wider use in the PICU is bedside ultrasound. As intensivists gain more experience with this modality, some centers are gauging intravascular fluid status by examining alterations in the inferior vena cava diameter that vary with respiratory cycle; although to date, this approach has only been validated in adult patients. Bedside US/echocardiography can also be used to determine cardiac contractility as a “snap shot” that provides insight at a single point in time; however, given the dynamic nature of changes in hemodynamics in pediatric sepsis, the field awaits a more reliable, real-time, non-invasive, continuous monitor for cardiac output. In some cases of persistent clinical signs of sepsis without an obvious source of infection, imaging studies (e.g., computed tomography [CT] or magnetic resonance imaging [MRI]) to identify occult abscesses can be helpful. The diagnosis of sepsis and severe sepsis/septic shock relies on the presence of a systemic inflammatory response (tachycardia, tachypnea, hyperthermia, and leukocytosis) as a result of an infection. As reviewed above, septic shock presents with signs of inadequate tissue perfusion, but can be related to two main hemodynamic states. Similar to adults with septic shock, the minority of pediatric patients with septic shock present with elevated cardiac output and low systemic vascular resistance. This hemodynamic profile is characteristic of a “distributive” shock state (other examples include neurogenic and anaphylactic shock). This hemodynamic state is classified as “warm shock” and is associated with the signs listed below. Conversely, the majority of pediatric patients present with a low cardiac output and either high (typically) or normal SVR-–a hemodynamic state described as “cold shock” with features listed below. This distinction is critical to determine because the therapeutic approaches differ, as described in Table I. If you are able to confirm that the patient has sepsis or septic shock, what treatment should be initiated? 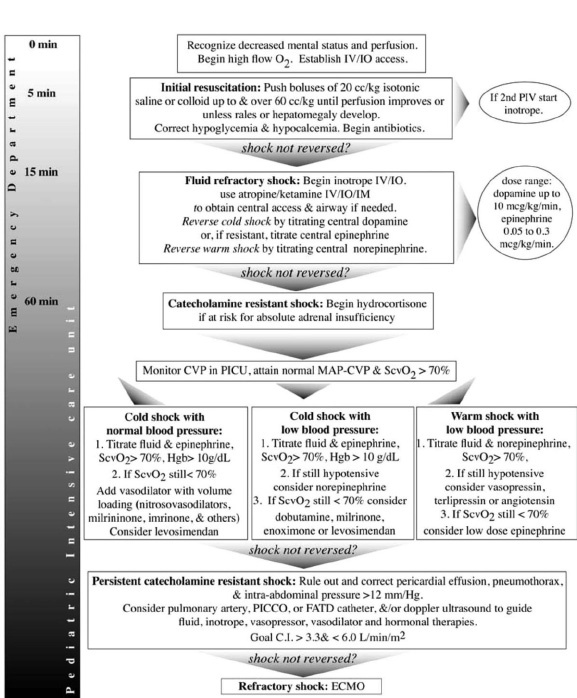 Once the diagnosis of sepsis/septic shock is recognized, the clinical practice parameters for hemodynamic support of pediatric and neonatal septic shock should be followed (see Brierley J, et al. Clinical practice parameters for hemodynamic support of pediatric and neonatal septic shock: 2007 update from the American College of Critical Care Medicine. Crit Care Med 2009; 37(2): 666-688). The treatment algorithm is listed in Figure 1 for infants and children, and in Figure 2 for neonates. Source control of infection: this includes timely institution of empiric anti-microbials targeting the common and suspected pathogens for the patient; and active drainage of consolidated infections/abscesses. Multi-organ support using common PICU modalities: mechanical ventilation for respiratory failure, inotropic and/or vasopressor agents for hemodynamic support, renal replacement therapies for oliguric/anuric renal failure, transfusions for anemia, thrombocytopenia and coagulopathy and early institution of enteral nutrition once hemodynamically stable on low doses or no vasopressor agents. From Brierley J, et al. Clinical practice parameters for hemodynamic support of pediatric and neonatal septic shock: 2007 update from the American College of Critical Care Medicine. Crit Care Med 2009; 37(2): 666-688. Brierley J, et al. Clinical practice parameters for hemodynamic support of pediatric and neonatal septic shock: 2007 update from the American College of Critical Care Medicine. Crit Care Med 2009; 372): 666-688. The primary adverse effect from this approach emphasizing aggressive fluid resuscitation early is the potential to fluid overload a patient, resulting in pulmonary edema necessitating escalation of respiratory support, including the need for mechanical ventilation. However, this has been shown to not occur frequently when additional hemodynamic support (e.g., inotropic and/or vasopressor agents) are instituted in a timely and complementary manner with ongoing fluid resuscitation that provides adequate cardiac filling/preload. Invasive lines (e.g., central venous and/or arterial catheters) and endotracheal tubes that are necessary to support the patient with severe sepsis and subsequent respiratory failure can place the host at risk for developing hospital-acquired/nosocomial infections. What are the possible outcomes of sepsis or septic shock? In the United States, sepsis is one of the leading causes of death, while worldwide, sepsis is the leading cause of death in children under the age of 5. In the United States, recent epidemiologic surveys using administrative databases suggest that the overall mortality of children with sepsis is ~4%. This varies between previously healthy children (~3%) and those with an underlying chronic co-morbidity (~6%). Current estimates of the overall 28-day mortality rate of children with severe sepsis are estimated to vary between 6%-10%, with the majority of deaths occurring in children less than 1 year of age. Importantly, it has recently been observed that sepsis appears to have a longer mortality burden than previously appreciated, as over 6% of children surviving a “sentinel” sepsis event at 28 days die within the next year, often as a consequence of another infectious complication. Thus, we may only be beginning to understand the full burden of sepsis on mortality in US children, and it is likely to be even greater in the developing areas of the globe. Finally, very little is known about the associated morbidity suffered by survivors of pediatric severe sepsis. This should be an active area of research for clinicians in pediatric critical care medicine. Sepsis is one of the most common causes of death in children worldwide, with approximately one-fourth of pediatric patients admitted to a hospital meeting the criteria for sepsis, while 4% meet the criteria for severe sepsis and 2% develop septic shock. In the United States, sepsis accounts for nearly 43,000 hospital admissions each year, with a mortality rate reported for severe sepsis of approximately 10%, which provides an estimate of 4300 deaths per year nationally. The incidence of severe sepsis is highest in neonates (5.2 cases per 1000 population), followed by children of ages 5 to 14 years (0.2 cases per 1000 population). The presence of co-morbid conditions and existing organ dysfunction is associated with worse outcomes and higher resource utilization in patients admitted with sepsis. Single-nucleotide polymorphisms in cell surface receptors of immune cells (i.e., Toll-like receptor 4), inflammatory mediators (i.e., cytokines), and proteins involved in the coagulation cascade (i.e., PAI-1) appear to be associated with increased susceptibility to sepsis. Genome-wide expression profiling in children with septic shock suggests that genes involved in zinc biology and adaptive immunity are important in surviving sepsis. Experimental data suggests that epigenetics, inheritable phenotypes resulting in alterations of chromosomes without alterations in DNA nucleotides, may play an important role in sepsis and influence long-term outcomes in sepsis. The immune system of a child recognizes invading pathogens through a set ofcell-surface receptors, microbial-associated molecular patternreceptors (MAMPs) on immune cells. Once invading pathogens are recognized, a series of genes are induced, resulting in the release and activation of inflammatory mediators, namely, chemokines and cytokines. These mediators then further activate additional immune cells, resulting in the amplification of the inflammatory response, termed SIRS(systemic inflammatory response syndrome). With an ongoing SIRS response, the inflammatory mediators can lead to hemodynamic compromise, resulting in the clinical signs and symptoms of sepsis/septic shock. The contribution of alterations in individual genes and the regulation of the induction of genes involved in the inflammatory response and how these impact the outcome of sepsis are still under intense investigation. For a comprehensive review of the pathophysiology of sepsis, the reader is directed to the references listed in the “Evidence” section of this chapter. Acute respiratory distress syndrome (ARDS) is commonly associated with sepsis. It can develop early in the presentation of sepsis as well as during the initial resuscitation. The hallmark of ARDS is hypoxemia with multifocal infiltrates on chest x-ray. Most patients with ARDS will require mechanical ventilation for respiratory failure. Renal failure can occur in up to 40% of patients with severe sepsis, sometimes resulting in fluid overload that may be an independent risk factor for mortality. The merit of early versus late institution of renal replacement therapy, most commonly as continuous veno-venous hemofiltration with or without hemodialysis (CVVH/D), continues to be an active area of investigation in pediatric critical care. Children who require prolonged multi-organ support that may be associated with the use of steroids (stress hydrocortisone therapy), aminoglycosides (for gram negative bacterial coverage) and/or neuromuscular blockade, are at risk for prolonged weakness from so-called critical illness myopathy or polyneuropathy that requires prolonged and aggressive physical therapy/rehabilitative care. Finally, long-term mortality (~6% over the subsequent year) in survivors, similar to what has been observed in adult survivors of sepsis, appears to impact long-term outcomes in severe sepsis. Interleukin-8 (IL-8) has recently been shown to be useful in stratifying patients who are at increased risk for death from sepsis/septic shock, although the benefit of IL-8, as well as other biomarkers of sepsis, in the identification and treatment of sepsis remains to be established. How can sepsis or septic shock be prevented? Evolving vaccine strategies can have a substantial impact on the incidence and epidemiology of sepsis in children. For example, introduction of routine vaccination against Haemophilus influenzae and Neisseria meningitidis has had a significant impact on the incidence of sepsis related to these two pathogens. Additional keys to prevention of the progression of sepsis to more severe forms include its early recognition with prompt treatment of infections, fluid resuscitation, and appropriate hygiene for patients at risk for infections. Early and judicious use of antibiotics for patients with SIRS due to infection is necessary to prevent the progression to septic shock. This may require incision and drainage in patients who have an abscess as the source of their infection.